Yes it is a good opportunity for church unity if His Holiness Patriarch Marchorewos comes.And I see no other option. Government should leave the Church to exercise Her right. Yasakegn. Dimstachewenima ayenew minun enisemalen. Le Haimanot Yemotu nachew yibal neber neger gin besirachew YeBEtekirstianin Meleyet wededu. Lehudamoch Medirek kefetu. Leleboch tilik dimist setu. Poletikegnoch endeiyakenekinubat mikiniat honu. KEzih belay dimst ale? Yasazenegn demo. Zarem lay sew yeminamelik Yehen hulu tefat yaderesew besachew mikniat kehone, minew amlikotachenin gira agabanew? Ay dejeselam bilachehu demo Merkoriosin promote madireg fekedachehu? Do you think that makes difference? Abune Mekorios is in Atlanta. It it very very very important to bring back "abune Merkoriyos", to our beloved holy church unity. "God bless our church and our country"
Before what he want to do we ask abune Merkerewos why first the synodos try to make agreement with all fathers ( erke-selam comite) b/c in that agrement the needs of thes father can simply official. May God spirit can told thes what must do for this first better give priority for peace! Senodose anode hono. charo Madehaneyalame yasayane. I have been asking this question for long period of time. I have been also discussing this will my friends a lot of times. We need the father to go out and speak so that we can understand situation better. If he won't, I think we all practically couldn't be able to consider his existence in the coming spiritual leader selection process. God bless him and all of us! Thanks Dejeselam for being me and my friends voice! The right question at the right time for the right father. I and my friends have been discussing the same question a lot of times though we couldn't be able to answer. I hope God help him to do so. God bless him and all of us! Thanks Dejeselam for being the voice me and my friends. እውነተኛ ሃሳብ ግዜውንም የጠበቀ ነው ሁሌም በሃሳባችንም የሚመላለስ ነው ብዙውን ጊዜ መግለጫም የሚሰጡት አባ መልከጼዲቅ ብቻ ናቸው ለምን? His Holyness Abuna Merekoriose great spiritual leader, he was strongly praying continuously , he is rearly speak to any one. he his not that much bothered but the power of the church even though he is the legal Patriarch of ethiopian orthodox church. but dejeselam why you need his voice for he is not street politician has big mouth and talk nonsense. his well educated in the church theology traditionally, he believes nothing powerful and stronger than prayer to God. God will do every thing in his behalf, do not be paranoid. ቤተ ክርስቲያንን የከፋፈላት ሰው እንዴት አንድ ሊያደርጋት ይችላል? እኛ የሚሰደድ ወይም የተሰደደ ሲኖዶስ የለንም ሊኖረንም አይችልም:: ቤተ ክርስቲያናችን ኢየሱስ ክርስቶስን እንጂ ፓትርያርክ አታመልክም!!! EGZIABHER SELAMUN , FIKRUN, ANDINETUN yawurdlin! I can't say it is not a proper question to ask. I said the same thing when I heard Abune Paulos's death.But if you think about it in depth, there are many things that needs to be done before that. For example if he (abune Merkorios)comes to Ethiopia and took the place, will he agree to avoid the using of organ(piano)in the church? B/c his voice (abune Melketsedek) supports the use of piano and there are churchs under sidetegnaw synod and use piano. I believe it is very easy for fathers in Ethiopia to forgive and take back these fathers(Abune Merkorios and papasat appointed by him)but will they agree to stop their distorted teachings about Ethiopian Orthodox church? Will aba Weldetensae (Menafik,who said....many wrong things about Dingil Mariam and our church cannons), confess for his deeds? I think that is the hardest part of dealing with Abune Merkorios and his followers in US (since most of them have minfikina and just follow abbe Merkorios for some benefit and for being papas one day. So we need to think about all these things before just saying abune Merkorios have to take the chair for our mother church peace. Agibab yalew tiyakie new @ dejeselamawuyan. Sile betechirstian andinet hulachinim linasib yigebal,Egziabher yirdan. Amen! where is Abune Merkorios?He was in Eritrea 2-3 days ago visiting armed Ethiopian oppositions and missing a church visit!! !.Abune paulos was politically aligned to the ruling party,EPRDF,no question as abune merkorios is to the DERG.I am no one to tell you this but,Please all Abunes leave politics to the politicians.YOU are supposed to be involved in your religious duties.is that not what Jesus preached? Given the current official statment of the fathers in exile (https://www.quatero.net/pdf/sle_Abune_poulos%5b1%5d.pdf), I am optimistic about a postive peace aggrement soon between fathers soon. So, let us keep encouraging that.We hope we will hear our father will speak when it is appropriate. I don't even see the point to open tee discussion on how and why His Holiness left the Seat as we already heard enough the arguments, which practically has neither spritual nor logical sense in either side. Let us go forward and look for reconcilation rather. May God help our fathers to resolve this issue wisely and let us see all fathers and children of the church pray together. where is Abune Merkorios ?He was in Eritrea 2-3 days ago,visiting the armed oppositions and missing a church visit there!! 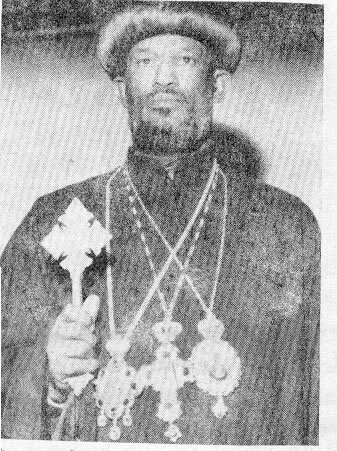 !.Abune Paulos was aligned to the EPRDF,no question as Abune Merkorios is to the DERG.I am no one to tell you this,but please Abunes you are supposed to do your religious duties and defend the church from external influences.Leave politics to the politicians.Is that not what Jesus preached.You are supposed to preach love,forgiveness,tolerance and reconciliation ,not to be the source of dispute,hatred and division. LET GOD HELP US ALL. Please hold your fire. Let him speak his mind as requested, which has been long overdue and we need to pray for reconciliation of our fathers whether he becomes the Patriarch or not. This division has hurt Orthodox Chiristians(especially in the Diaspora) to their bones. Let's always look at the Greater picture and wish that our church becomes unified again. We need to put pressure on our fathers to bring this division into a halt. A new Patriarch might emerge with the blessing of bishops at home and in the diaspora or Abune merkorios could lead the church again for a couple of years until his death. Whatever the outcome, this is time for reconciliation and unity. where is abune merkorios ?He was in Eritrea 2-3 days ago,visiting armed opposition groups and missing a church visit there !! !.abune paulos was aligned to EPRDF,no question,as as abune merkorios is to the DERG.I am no one to tell you this,but please abunes,you are supposed to do your religious duties and defend the church from external influences and leave politics to the politicians.Is that not what Jesus taught?.You are supposed to preach love,tolerance,reconciliation not to be the source of division and hatred .MAY GOD HELP US ALL. Kebede Bogale የተባሉት አስተያየት በጣም አስደስቶኛል የልቤን ነው የተናገሩልኝ!!! ብጹዕ ወቅዱስ አቡነ መርቆሪዎስ ወደ መንበራቸው መመለስ አለባቸው እውን የቤተ ክርስቲያናችንን ሰላም እና አንድነትን ከሁሉም በፊት የምንናፍቅ ከሆነ! Benegerachin lay tsehafiw betam ye abune paulos adnaki or degafi yimeselal.Lemehonu Likane Papas Abune Merkorios Ayitahachew takeleh. Ene ke 1dim sost gize yemayet agatami neberegn..Yihewum Bitsuwe Abune Zena Markos yemotu gize new. Normally, he doesn't speak. He is so humble but he sings really really great. Always when he come to Gebriel in Seattle, he sings including current Mezimurs. He has amazing voice. Otherwise, he never speak in public and it is Bitsuwe Abune MelkeTsedek who speaks for him. This is the way he is. He is so humble with amazing voice for songs as well as Kidase. I m blessed that I attended his Kidase. So for your question, the patriarich is like that and you will never hear him speak but when he sings or do kidase. For one of the commentors, it is not Patriarich Abune Merkorios (መርቆሪዮስ) who is in Eritrea. It is Abune Mekarios(መቃሪዮስ) who went to Eriteria By the way, you are definitely woyane and tiraz netek. you dont even different the two names. Above all,yes God is a fighter. Bible is history of war, where God helps his people to be freed like from Egypt. There is no any contradiction if Abune Mekarios went to armed forces who are trying to liberate the country from the woyanes. We need a strong prayer. I hope God will answer our prayer. It is very difficult time. our spritual fathers aren't doing the right thing. I amn't accusing any side ,but generally their heart isn't ready for negotation. It sad ,but that is what it is.I strongely believe God will anoint a very good spritual leader to watch after his children. May God bless everybody. የቤተክርስቲያን ህልውናና አንድነት በአንድ ሰው መውጣትና መግባት ላይ የተመሰረተ ሊሆን አይገባም:: ቀድሞ እንደነበረው አይነት "የጎንደር ምንቸት ተመልሰህ ግባ..." የሚባልበት ዘመን አልፎአል:: ከቤተ ክርስቲያን የተሰደዱ ወደ ቤተክርስቲያን እንዲመለሱ እንጂ ከስልጣን የተሰደዱ ወደ ስልጣን እንዲመለሱ ማድረግ የክርስትና ዓላማ አይደለም!!! በእውነቱ አፋችሁን ሞልታችሁ ይመለሱ የምትሉ ልታፍሩ ይገባል:: በአሁኑ ሰዓት በእርሳቸው ስር ያሉ አብያተ ክርስቲያናት የማንም መፈንጫ ሲሆኑ እያየን ነው:: በእውነቱ አባ መርቆርዮስ እነዚህን በጣት የሚቆጠሩ አብያተ ክርስቲያናትን እንክዋን በአግባቡ ያልመሩ በምን መስፈርት ነው የሚመለሱት? Abune Samuel is one of the new bred of abunes who is dedicated and can be a good leader. May God bless Dejeselamawuyan for opening this extremely important discussion. The division in our church for the past 20 years has brought an extraordinary damage. Some may not appreciate the gravity of the problem for various reasons. But for me it has been one thing that has been worrying me the most. Such division may have delighted Satan and strengthened the enemies of our Orthodox Church; however, it has indeed weakened our church significantly. We need to end this once and for all. We need to stop saying 'yen entina betekirstian'. We must stop the bickering and stand united in defense of our mother church from real enemies who want to destroy her. The division 20 years ago came into existence when the Church's canon law was disregarded Patriarch Merkorios was unjustly forced out of his office. Any other reason including ill health etc is discredited. We have now 20 years of experience how the government justifies the wrong it does by orchestrating drama like testimonies, court trials etc. One can read the wikileaks diplomatic document from the US embassy detailing the then PM Tamirat Layne confessing how the government caused the church's division. The main thing now is how we can restore unity in our Church? Regardless of what we feel about one another, we must correct the wrong that led to the division of our church two decades ago. This can be achieved by returning Patriarch Merkorios to his 'menber'. We must do this for sake of uniting our church. About Abune Merkorios: although many may have views based on emotions and without facts, he is a very humble human being, real monk, man of prayer, full of a lot of patience, graceful father and melkam kahn. May God give wisdom to our fathers from either side to resolve our church's division. May God help us and guide us in uniting our church. Lets do this for the sake of uniting our church. Lets not repeat the same mistake by electing another fake 'patriarch' while a legitimate one is alive and without fault. Becha bezu malet bechalkugne bezu neger weste ale bachiru Egziabher yemifekid bihon yeselam nigigeru esachewinim yechemere bihon emenugne selam beketita yinmetal betarik esachew le siltan asibew ayawikum gin ene Melketsedek ena tikit sewech alu ahun sim megeletse bayasifeligim enantem tawekuchewalachu ena betechale wegentegna sanihon enihin talak abat kenezih lesigachew kaderu bezuriyachew ketekolekolu kemagna please lemalakek gezew ahun new...egna endeminasibew esachew lesiltan ayimetum ....becha asfelegai kehone techemai mereja lemestet mengedu kale zigeju negne ena hasabachihu tiru enem Kidus abatachin ebakewot zimetaw yibekal bayi negne. Who is the "legitimate" patriarch and who is the "fake" patriarch? Is Aba Merkorios, who left his children alone to seek his comfort, a 'legitimate' patriarch? እውነተኛ እረኛ ነፍሱን ስለበጎቹ አሳልፎ ይሰጣል እንጂ ጥሎ አይኮበልልም:: Okay, he left us alone. We tolerated that. Why he organizes and catalyzes a 'fake' synod. A patriarch is assigned by a synod but can't establish a synod by himself. GOD BLESS OUR CHURCH & OUR COUNTRY. The question is do we want our church to continue being like our politics or not. Should a monk who is supposed to be dead on earth leave his church, only because new politicians came to power? What was he afraid of? His life? Where is the church divided? The church is divided due to the former patriarch outside Ethiopia. Let us all pray to have a genuine church leader that will not be influenced or threatened by government. Emotions aside, Let’s do this for the sake of uniting our church- have only one Patriarch at a time. Are you with your right minds to think that he was the reason for the church's division because of coming of late Aba Paulos? This is 'woyaneyawi firde gemdilnet'. The reason for the mess our church finds itself now was the transgression of our church's cannon law by the TPLF/EPRDF to assign their loyal fellow ethnic person. For those who say Abune Mekrorios should not have gone into exile, I say going into exile is not new. The bible and history tell us spiritual leaders including Jesus had gone to exile. For those who say Patriarch Mekorios should have died in Ethiopia, what is there to be gained by a purposeless death? What did we gain when the derg killed the patriarch before Abune Teklehaimanot? May God give wisdom to our fathers inside and outside of Ethiopia to unite our church. I think His holiness is in Asmara, Eritrea. The last place his eminence is expected. Instead of working for peace and uniting the church, his holiness abune Mekarios chose to travel to the butcher Isayas` country and encourage the mercenaries in Eritrea inflict more damage and bloodshed in Ethiopia. May his holiness reconcile himself and the "synod in exile" with the Ethiopian people. If I am not mistaken the pop who went to asmara as you have said it called abune Mekarios not Bitsu wekidus abune merkorios. Daniel checkul selehone abune mekarios yetebalewune le abune merkorios seteto sehetet lay wodeke. Pleease know what you right about before you comment on a very delicate matter. This is really nonsense. Daniel , you rush to comment. It is nonsense. please know about what you want to comment before you react and fail in to a big fault. If you knowingly said the Patriarch went to Eritrea , I say you are not honest and you need to reconcile with yourself. The Patriarch is His Holiness Abune MeRKOrios NOT MeKArios. His Holiness DID NOT go to Eritrea as you falsely wrote above. I think we should refrain in wrong accusations and attempts to cause division between Abune Merkoriwos and Aba Melketsedek. This does not help resolve our church's problem. They are brothers in faith in good and bad times. I also don't think Abune Merkorios should make a speech. For one thing he is not a man of opportunism who wants to grab attention just because a fellow human being has died. No speeches from any side are necessary other than the expression of determined will to negotiations in solving the church's two decade old problem, the division. The best venue will be through the EOTC Peace and Reconciliation Committee and it should be they who need to update us on the progress. ደጀ-ሰላም ሆይ! መሪያችሁ አባ-ገ/መድህን የሉም።በመፈንቅለ-ፓትርያርክ ለ 21 አመት በስልጣን ላይ የማይገባ ስራ ሲሰሩ ኖረው ሄደዋል። በሃይል ከመንበራቸው የተባረሩትን ብጹዕ ወቅዱስ ፖትርያርክ አቡነ መርቆሬዎስን በሃይማኖታቸው ስለ-ሃይማኖታቸው መሰደዳቸውን ግፈኛው ታምራት ላይኔ የመሰከረላቸው መሆኑን እንደ አዲስ አይነገራችሁም።መሰደዳቸውን ደግሞ ወልደ-እግዚአብሄር ኢየሱስክርስቶስም እንደ መለሰ ዜናዊ ግፈኛ በነበረው ሄሮድስ ዘመን ተስዷል።ሁሉንም ለእግዚአብሄር ብለው በጸሎት ስለተጉ ለምን እንካ-ሰላንቲያ አልገጠሙም ብላችሁ ብትባዝኑ ብፁእ አባታችን የሚሰሟችሁ አይመስለኝም አትድከሙ! ለሃይማኖታቸው; አልተሰደዱም; ለጥቅማቸው ;ነው ምን; ተጎዱ ;ዘር ;ማንዘራቸውን; አውጥተዋል; ታዲያ; ቢመለሱስ? GOD BLESS US AND OUR CHURCH. God has spoken for him. It is nice so many people want to see Unity and are sick of the division. I hope people would appreciate and respect the fact that going on mass media OR talking to interviewers is not necessarily the right way to communicate with the people and specially for Spiritual fathers. The committee working on getting the two groups together is talking to both groups. We should respect Abune Merkorios's way of not engaging in interview OR dialogue that is usually taken out of context and also not appropriate to his level. Let him work with the committee and the mass media is not the appropriate place for him at this moment. I hopt it is God's will and time for unity and we should focus on praying and also not damaging the process, also push our individual churches and the committee to work faster and better in the negotitation. We should stop pressuring him to come to mass media. I suggest that you post your article with a recent picture of His Holiness Patriarch Merkorios instead of an old picture that does not show his current persona and grace. You can easily get it in the web,please visit http://eotcholysynod.info/home/. May God help us unite our church. Amen. His Holiness is the man of God who prefers praying/fasting than talking and politicking. I, as individual, believe what has been transpired has a lot to do with his personality. While I am disgusted by most of our fathers (I said most, cause I know there are few Men of God) and lost faith in them; both here abroad and in Addis. He never utters any conversation that leads up to his future. NEVER. I have no doubt, in the end; things will have a better ending to the church. I know all the discussions about why His Holiness should return or why he shouldn’t return and all the arguments. It's true that one could take my comment as a biased feeling to His Holiness. I can attest to everyone for a matter of fact that His Holiness cares NOT about power or position. He does not. His handless might. Actually they do care about power and position than anything. But His Holiness DOES NOT. This is beyond power or anything. FOR THE SAKE OF THE CHURCH UNITY, ADVOCATE FOR THE RETURN OF HIS HOLINESS AND REUNITE THE CHURCH. He is an aged man of God and electing another patriarch will for ever and ever damage the church. If a new patriarch is elected while His Holiness is alive, who is to say those here abroad won't elect another Patriarch if/when His Holiness passes away? It will be historical suicide for the church. We can NOT afford to miss this opportunity. I hate to say this and may God forgive me for saying this but I realized the EOTC is led by 85% wolfs and 15% men of God. The numbers are not scientific but I personally know many who are just plain men who fall for money, power, and worldly things rather than serve the Lord. This unification will serve as a healing the wounds and close doors to those heretics who are using this leadership gap as a way to spread their venom. "ቀዱስ ሲኖዶስ እንደተፈለገ የሚወጡበትና የሚገቡበት ሆቴል ቤት አይደለም። ቤተ ክርስትያንን ሁለት ከፍሎ ቤተክርስትያን አብሮን ተሰዷል ያለ ሰው እንኳን ሕጋዊ የሞራል መብትም የለው።"
May God forgive you, for not know what you are saying. All I can say while tears on my eyes.